Today I’m delighted to welcome my friend, Kelli LaFram. I met her through an online Bible study several months ago. I love how grounded in the Word and friendly she is. I think you’ll like her, too! Today she’s sharing her Bible study methods. Enjoy! What do you think of when you hear these words? Maybe you think of a book written to help you understand God’s word. Perhaps you think of a group of people meeting together to discuss God’s word. It could be that you picture a group of people with an additional book intending to talk about God’s word, but instead they wind up shooting the breeze for so long that they never actually end up talking about the Bible. (Yeah, it’s happened to me, too). There is nothing wrong with written Bible studies or small group meetings. In fact, these are very, very good things. 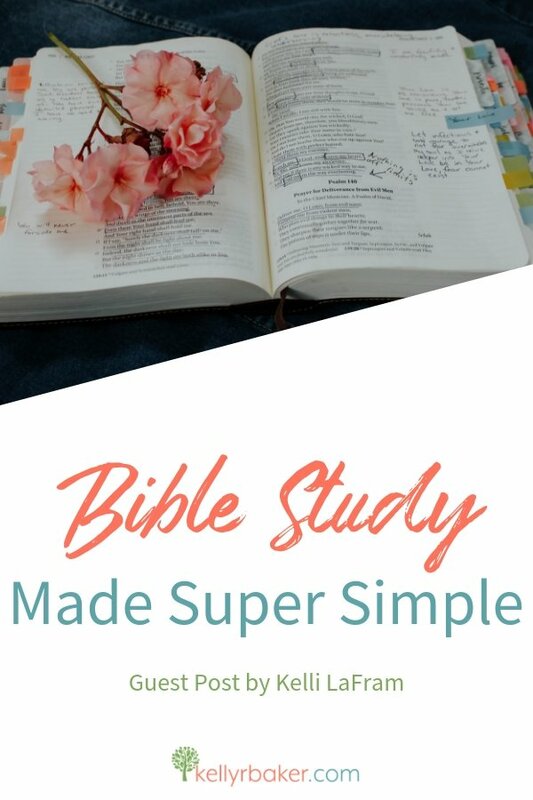 But what if Bible study could be made simple—super simple—so simple you could do it on your own? What if you pictured something different when you heard the words Bible study? What if you pictured yourself, your Bible, the Holy Spirit, and not much more? Wouldn’t that be an amazing Bible study!?! I think so. And here’s something you might not know: it can actually happen. You don’t need another book with a fancy cover to hear from God. You don’t need a group of people to interpret the Bible for you. With the Holy Spirit as your guide, you can do it on your own. Here are two simple techniques to help you have a personal and intimate time with God. Step 1) At the top of a blank page write the passage and passage title you are studying. Step 2) Next, without removing the page from the notebook, fold the page in half lengthwise. Draw a line down the crease—now you have two columns on your page. Step 3) In the left column write out, word-for-word, the scriptures that jump out at you. Step 4) In the right hand column, next to the scripture, write out your thoughts, questions, other scripture that come to mind, song lyrics, word studies (see below), or anything else you think is relevant to the scripture. Step 5) Once you are done journaling, write out a prayer across the full width of the next blank page. Thank the Lord for new insights and truths He has revealed to you and ask Him for the grace to obey any commands He has given you. I love word studies because, even though God’s word is infallible and has withstood the test of time, a lot can get lost in translation. For example, in the English language we have one word for love, but in the Greek there were three words for love, each with a slightly different meaning. Looking at the original language that the books of the Bible were written in can give us a lot of insight into what their authors intended to say. Step 1) Once you are on the website, type the passage you are studying into the search field and select the translation you are using. Hit the search button. Step 2) On the next page, locate the verse with the word you want to define and click tools. Step 3) Next, click the Strong’s reference number which will lead you to the definition of the original Greek or Hebrew word in the passage. I like to write the definition down in my double-entry journal. Blue Letter Bible also shows you other passages that contain the same original Greek or Hebrew word. I often read these passages as well to “feel-out” the word and explore anything else the Holy Spirit may be revealing to me. So there they are—two simple techniques to help you have a personal and intimate time with God. Do you have a favorite study technique? Share it with the rest of us in the comments below. Wife. Mom. Coffee drinker. Bible reader. Jesus believer. Plus a writer, painter, sign-maker, & furniture-flipper. That’s Kelli all summed up. Kelli is learning that Jesus and her faith in Him don’t belong in a box. Rather, He is present in every aspect of her life and her faith should be visible to all who meet her. You know, the whole “let your light shine” thing. That’s why in her little corner of the internet you’ll find her sharing about all sorts of things – from painting to parenting to praying – and how they all point back to His goodness, His grace, and His glory. Visit at KelliLafram.com or on these social media platforms: Instagram, Facebook, Pintrest or Twitter. *This post may be linked up. I’m blessed to see you here two weeks in a row, Nicole! I hope you dig into Bible study soon and try out these tips! Hi Nicole, these really are simple and the more often you use them, the easier/quicker they become. I hope you come back and tell us what you think after you use them. Hi Sherry! BLB is a great resource and it has so much more than just word study tools. It also has great Bible commentaries from many trusted Bible scholars and pastors. I have it bookmarked 🙂 Thanks so much! Great to see you here, Sherry! Kelli and I are Blue Letter Bible junkies. 😉 It’s by far my favorite. I think you’re going to love it! Great tips! Word study is one of my favorite ways to study the Bible! The column idea is something I’ve never heard of before, but it sounds like a great way to teach my high school girls how to start studying the Bible. That’s wonderful that you are teaching those girls how to start studying the Bible. And how cool that God used this post to show you some more tips. Blessings to you, Casey! I’m so glad it was helpful to you, Valerie. Please come back and let us know how it worked out after you try them. So glad you can add another method to your studying. Thanks for sharing about the Bible mapping method. That is another great technique! Praying you stay nourished and thriving as you try out these tips this week, Betsy! What a helpful post! I usually use a list format, but I really like the two-column idea. And I will check out the Blue Letter Bible link too. Thanks! Glad you found it helpful, Sarah! There are so many fun ways to dig into the Word. I think you will find BLB useful, too. Thanks for stopping by, and praying you stay nourished and thriving! Great suggestions! I’m going to try both ways. I haven’t used blueletterbible before so I’m going to check that out too! These are great ways to study God’s Word! I look forward to trying the double entry system. I have logos Bible software and have been meaning to learn to use it more effectively, but blueletterbible sounds like a good option to try. I’ll be pinning this on my posts worth reading board. I’ve heard of logos but never tried it. Let us know what you think of BLB. Wow, I love this! I am going to check out the resource website since I have never heard of that one. I was just getting kind of down about it too because I don’t really have the funds to buy the Bibles I would like to, or a Strong’s for that matter. Very appreciate of this wisdom, thank you both! BLB is great, not only because it’s free, but because it’s a lot lighter than a printed Strong’s. Have you seen one of those books!?! They are enormous! BLB has a pretty handy app for smartphones as well; which makes the Strong’s even more portable and accessible. Let us know what you think of it! Awesome! So glad to be of help! 😉 You’re going to love BLB. I have the app on the front page of my phone, too. I love word or subject studies. There is so much hidden in the Bible if we just look. I also love the BLB site it has everything I’ve needed in studying. Thanks for sharing with Thankful Thursdays. Yes there is! So many treasures! Love this! Simple is good – SO good! Practical and something we can all fit in our everyday lives. Depending on our personality, our season of life, or our life circumstances, we may not be able to attend a group Bible Study and that can be disheartening. Thanks for giving those with a passion for the Word of God and eager to know Him better, another option! Thanks so much for sharing at #MomentsofHope!